A quick word on the King George. The credentials of Workforce are there for all to see. Who wouldn’t want to see him to go on and confirm himself as this year’s wonderhorse after his extermely impressive Derby win? But it seems to be forgotten that Cape Blanco beat Workforce in the Dante by over 3 lengths (though Workforce had something of an excuse), and won the Irish Derby last time out. With Workforce likely to start at evens or odds on, and Cape Blanco at 6/1, is there some value in Cape Blanco’s price? What about the older horses? The last 10 years have only seen two 3yr old winners. With some of these older horses still improving, can we be sure this year’s 3yr olds are even good enough? Well, today we’ll see. Too much to savour to worry about betting. | Comments Off on King George value? Newbury, 3.20. Over 20 runners line up for a 5 furlong dash over Newbury’s wide, galloping 5 furlong course for ground on the soft side of good. 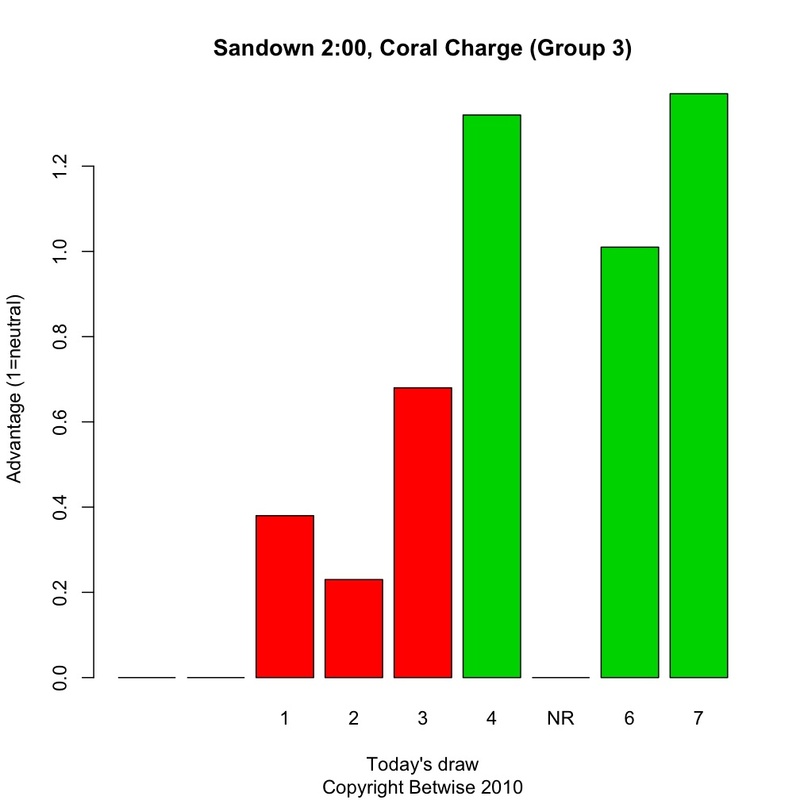 In case you were expecting one of Betwise’s super draw graphs to accompany the occasion, we’re sorry to disappoint. There just aren’t enough occasions when anything like this many runners line up for a 5 furlong dash at Newbury, let alone on this ground, to make a graph meaningful. In fact, it would likely mislead. If there is any identifiable bias, it is towards the far rail (so with low numbers), but there’s not enough data to state this with certainty. However, we’re somewhat encouraged by Blessed Place’s victory yesterday when it raced alone on the far rail, also. Front runner statistics are also unlikely to help us much in this race. With so many (fast) runners, it’s sure to be a true test of pace and unlikely that any runner can “steal” the race by getting an early lead. In fact, early pacesetters are liable to set up the race for something with a turn of foot towards the end – especially given that today’s test on the ground may be quite stiff. What to do in the case of a sprint without any obvious pace or draw angle? Why, look for the fastest horse over the distance, of course. 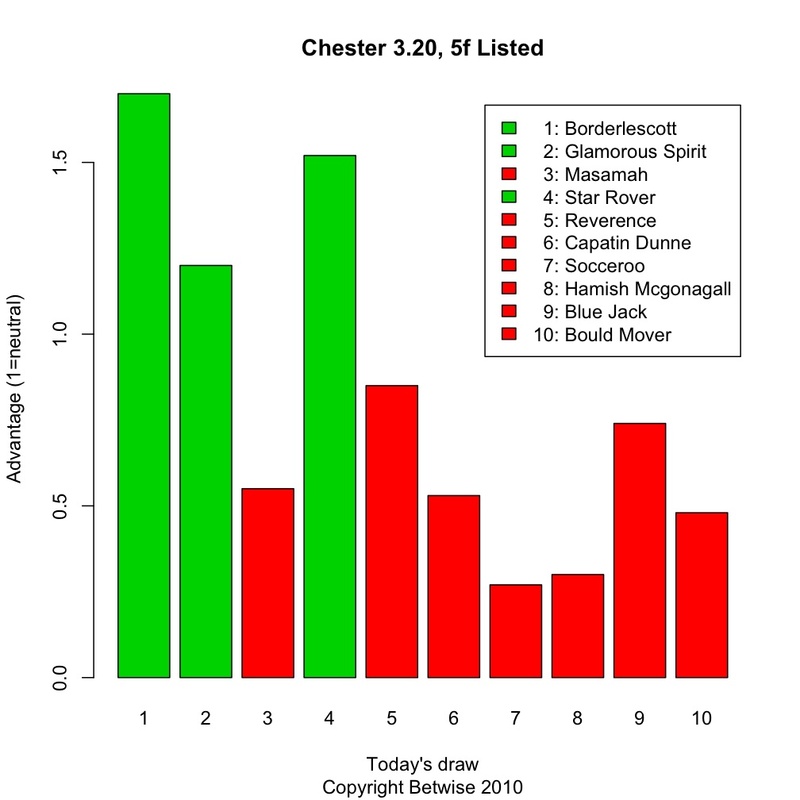 What better statistics to use in this case than the best speed rating for each horse (which we can find in the previous form of each runner in the Smartform database). There are a few contenders but with previous form on the ground, Ballista and Temple Meads stand out. If indeed there is an advantage to being drawn on the far rail, then Temple Meads, in stall 1, is also well placed to take it. But at 6/1 in a 25 runner field, Temple Meads will already be vying for favouritism with Richard Hannon’s leading hope, Reckless Reward. Both are short enough in price, we think, so Ballista will be better value, especially on the exchanges. However, the draw in 13 is something of an unknown and we have to forgive its last, somewhat below par, run. Of the outsiders, the Smartform speed figures show that Golden Shine is making nice improvement, recording a significantly better rating last time out, and will be an even bigger price on the exchanges. South Africa take on India in Durban in their Twenty20 match.